Yesterday’s short coup attempt (real time MoA) by parts of the military against the wannabe-Sultan of Turkey failed. Some 200 people on both sides were killed, some 1,200 wounded. to not put out a trusted public face to represent the coup. Erdogan escaped and could orchestrate the counter to the coup. He could continue to communicate with his security management, foreign politicians and his supporters. Without any well known alternative leader the public had only Erdogan to follow. The amateurish behavior of the coup plotter opens the question of who ran this show. Was this, as some asserted early on, an Erdogan plot to seize more power? There is no evidence for any of these theses and none of them clearly fits the observed pattern. The response will be harsh. Edogan will crack down on ANYONE he politically or personally dislikes – completely independent of their involvement in the coup. All political parties, even the mostly Kurdish HDP, spoke out against the coup while it was ongoing. The religious Gülen movement also opposed it. Most of the involved soldiers were told that they were part of an exercise. It will not save any of them from Erdogan’s and his supporters’ wrath. The somewhat coup-supportive early statements from Lavrov (“avoid bloodshed”) and Kerry (“stability!”) will increase Erdogan’s mistrust of any foreign official. Erdogan will now become even more paranoid and unpredictable than he was before. The domestic atmosphere in Turkey will become extremely strained. @chinahand TRE knew about the plot, made sure it would fail w/ help of loyal officers pretending to be part of it, & let it go ahead. 9:12 PM – 15 Jul 2016 (((Garrett Khoury))) @KhouryGarrettTurkey: Erdogan confirms coup forces surrounded his hotel in Marmaris…4 hours after he had left. That’s a special sort of ineptitude. 11:17 PM – 15 Jul 2016 Mustafa Akyol @AkyolinEnglishThis #turkeycoupattempt had not much to do with “Islamist-vs-secularists.” Secular opposition sided with the govt against the putschists. 11:53 PM – 15 Jul 2016 Gregory Djerejian @GregDjerejianIf you thought Erdoğan was becoming overly authoritarian bordering on some neo-Sultan or such oh boy just you wait now post-aborted putsch. 1:05 AM – 16 Jul 2016 Asaf Ronel @AsafRonelTurkey’s acting army chief of staff: Coup attempt was rejected by chain of command immediately. 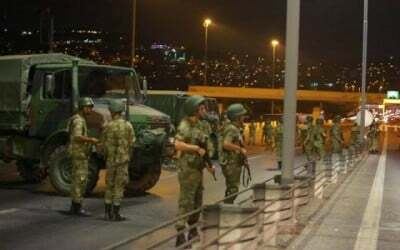 1:32 AM – 16 Jul 2016 Frank Nordhausen @NordhausenFrank#Turkey This was a weird coup. I was on Taksim square 3 hours, my impression was: that’s not real. I saw military in Cairo – no comparison. 1:38 AM – 16 Jul 2016 Elijah J. Magnier @EjmAlraiDespite results in #Turkey, Erdogan will be very busy internally, reforming, reshuffling, turing the army upside-down.His throne has shaken. Interesting how fast they drew up that list. This move was long planned and may have been a reason for the coup. See below. That is a direct Erdogan threat to the U.S. where Gülen lives. 3:41 AM – 16 Jul 2016 Putintintin @putintintin1Turkey jets which bombed #Ankara refilled from fuel tankers took off from Incirlik airbase!! 5:57 AM – 16 Jul 2016 ilhan tanir @WashingtonPoint10 State Council, top court members are detained allegedly for having ties to failed coup attempt. 8:24 AM – 16 Jul 2016 Jim Colella @Jim_ColellaReports today of 2745 judges removed after last night’s #TurkeyCoupAttempt. Wtf? How’s that related? Watch all that happens next. 9:15 AM – 16 Jul 2016 ilhan tanir @WashingtonPointConstitutional Court (US-Supreme Court) member Alparslan Altan, VP at highest court appointed by A.Gul, is detained. 10:42 AM – 16 Jul 2016 Joshua Landis @joshua_landisClearing out Gulenists, fall guys for coup. They aren’t know 4 strength in army. Still not clear who is behind this.